Trainers and Managers are a student athletes and a Coaches best friend. Four 4 Longhorn football coaches not only pay respect to Spanky Stephens ( in the middle) for his induction into the Southwest Athletic Trainers Association Hall of Fame, but the coaches also are paying respect to all Longhorn trainers for a job WELL DONE. Here is part of Spanky’s published career Bio. Associated with University of Texas athletic teams for over 30 years, Stephens began his career as a student trainer in 1967. In 1970 he assumed full-time duties as assistant to then-head trainer Frank Medina. After Medina suffered a stroke in 1978, Stephens took over duties of head trainer and continued in that role until he retired in January 2000. 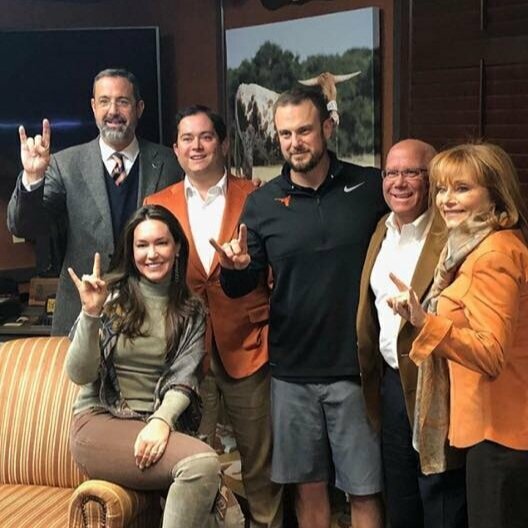 While at Texas, he supervised or worked directly with all sports, working with hundreds of athletes, five head football coaches, five head basketball coaches and other sports coaches. He worked with nine Longhorn teams that won national championships and was responsible for a strong student program that sent numerous qualified trainers into high school and college positions. Stephens has received numerous national and regional honors, including being selected to the All-American Football Foundation Hall of Honor, the Southwest Athletic Trainers Association Hall of Fame and induction into the 2002 Bellville High School Hall of Fame. In July 2001, Michael “Spanky” Stephens became the Executive Director for the Texas State Athletic Trainers Association after working 33 years at the University of Texas and the last 22 as the Head Athletic Trainer. Spanky served 22 years on the Governor appointed Advisory Board of Athletic Trainers and has served on numerous committees and focus groups within the NATA and State Government. Spanky has spent years setting concussion protocols to protect the high school athletes and provide the best health care for the players. His work continues and the projects he is involved will continue to make the health care for young athletes better. Anytime someone from an outside organization tries to change a system they will be perceived as a threat to larger institutions . It took Spanky’s organization a while to convince the UIL and the High School coaches Association that the Texas State Athletic Trainers Associations was an advocate not a threat to their sports, but the mission was accomplished. The Texas Governor signed the concussion legislation into law. David Andersons says about Spanky “Spanky became my client at HillCo during my first year with the lobby firm, 2003. His work on the concussion legislation, Natasha’s Law, is a textbook case of how to take a good idea and make it the law. The bill’s author was a first term member from Amarillo, Four Price. While he was a rookie then, Four is now one of the top members in the Legislature and he will tell you how important Spanky was with that bill and how much he learned about the legislative process as he worked on it. That bill became the model for many other states since 2011. The Story of the Billy Disch sign that said. "The Winning Tradition of the University of Texas will not be entrusted to the timid or the Weak" as told by Spanky Stephens. Spanky says “in 1975 when the Longhorn baseball team moved from the old baseball field to Disch Falk, I found a sign back in an old store room in the old field where the ground keepers keep their rakes, lime to line the field, and mowers. I took it with me and placed it in the new baseball locker room. Coach Bibb Falk( 1940-1967) the baseball coach who replaced Billy Disch (1911- 1939) came by for a tour and what a hilarious story that is…. Bibb Falk disliked everything about the new baseball facility - locker room, coaches office, and showers, but when he saw the Billy Disch sign hanging in the new baseball facility he raved about it saying that sign also hung in Uncle Billy Disch his locker room. “So, three days later Falk brings 3 of his cronies down to show them the new facility. I was taken back . Instead of voicing displeasure about the new baseball facility, he was raving about the great facility, but his proudest moment of the tour was the sign. He told them his story and reflected on the special memories of a special time in his life, and he was happy. As a final note, I know for a fact that Spanky Stephens was instrumental in convincing Coach Akers to include student managers and student trainers in the T-ring ceremony . Coach Akers thought it was such a good idea that he decided to make the T-ring presentation to managers and trainers retroactive. James Cooke and David Anderson know a lot about the Statute of Limitations. Please read article with a sense of humor. If stealing the OU game ball is not bad enough, he also stole the ball for the Navy game. I now know why. James chose to risk his reputation and a life sentence in jail for a second felony for something that has no economic value because he and Little Rail wanted to give the Navy ball to Jim Blaylock . God rest his soul but Jim Blaylock scared me more than Royal. James Cooke wanted to give the game ball to Mr. Blaylock because he knew Jim had a special heart, but for many of us on the team the image shown is as close to a smiling heart as we ever saw. James now wants to atone for his sinful ways and donate the OU game ball last touched by the late great Jack Mildred to someone special or to UT. Speaking about atoning for past sins, I think it is time for all managers to purge your demons by visiting the deep crevice of your closets and make the football heritage of Texas whole again. Give back all those “lost” footballs thru the decades and maybe we can sell them to fund a new “T-room at the stadium. Everytime I see Gary Mcintosh smile I think the worse for many lost game balls. And then there is Juan Conde who allegedly ( I hate that word) has in his possession the 1969 Big Shootout Arkansas game ball. 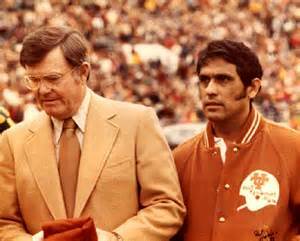 I now called on Juan to return that ball to the University of Texas so it reside in glory in the pending new Hall of Honor. David has a beautiful family. He is in front left with baby in his arms. I am surprised the family “football” did not make this photo. Maybe we can add the football photo at a later date for posterity. Then there is David Anderson story that shows how James Cooke’s days of infamous corruption infected the younger managers. David says “ James Cooke was two years ahead of me as a manager but he served as a role model for the younger managers in many ways, particularly his adept handling of the OU game ball. My senior season was 1972. UT beat Rice handily in Houston that year. As the game was about to end, the three senior managers, Bill (Sidney) Allison from Woodville, Barrett Gaus from Yoakum, and me, determined that we would expropriate the three Rice game balls when the final gun sounded. We planned our move, executed it well, and arrived in the visitors’ locker room with one ball each. Remembering how James had passed the ball to Little Rail, I wrapped mine in my windbreaker, stepped out of the dressing room, and gave the windbreaker with the game ball hidden in it, to my girlfriend (and now wife of 45+ years). A few minutes later Coach Glen Swenson rounded up the three senior managers and told us in no uncertain terms that he wanted those three balls so he could return them to Rice. All three of us expressed shock that he would think we had them, but he quickly located two in the area when the managers dressed. Coach Swenson pressed me about the third one, to which I replied quite truthfully, that I didn’t know where it was. That was the truth, as Jan and her friends had left the stadium and were somewhere between Houston and Austin, but I didn’t know exactly where. When I returned to Austin, I had the score and the date painted on the ball and now 47 years later, it sits on the shelf in my study, a few blocks from your house on Mesa Drive. Two Texas fullbacks ran for over 100 yards that night, with Roosevelt Leaks getting about 250 in the first half and Steve Fleming breaking the 100 year mark in the second half. Rice had no answer for the fullback dive that night”! In 2014 25 years after starting the Greater Houston Athletic Trainers' Society Hall of Honor with Danny Carrill0 (another student trainer for the Horns), and Mike Vara, Roy Don Wilson and Harris Argo were inducted into this Hall of Honor. 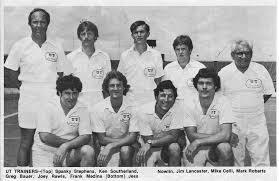 In the Fall 1975 Harris was Student manager for Coaches Joe Howell and John Gabrisch. On the way to play Churchill the coaches asked Harris if he wanted to be a student trainer: Harris said “what’s a trainer?” Harris was then introduced to Coach Henry Birdwell the Athletic Trainer at Holmes High school and he gave Harris his first assignment: The Holmes Husky Girls varsity Track team, yes he was hooked. In 1977 Coach TR St. Charles arrived from Vandy. At some point in his first year, Coach TR asked Harris about his plans after high school. Harris responded that he wanted a business degree and a fine job. T R said "what about being an Athletic Trainer." Harris in the present reflecting on his life journey says “ I might not have found my passion/career” if he had not asked that question. Harris graduated from Holmes in 1979 and on his 18th birthday, he received a call from Michael "Spanky" Stephens, the Head Athletic Trainer at The University of Texas accepting me as a student trainer for the Longhorns. Harris had the honor/pleasure of working as a student trainer for Spanky Stephens and Eddie Day, the Assistant Athletic Trainer at The University of Texas from 1979-1984. He worked football all 5 years and cross country and track for 2 years. From August 1984-1985 he was The assistant Athletic Trainer of the Houston Gamblers of the U.S.F.L. under Roy Don Wilson. From 1985-1991 he was the Athletic Trainer at Dulles H.S. 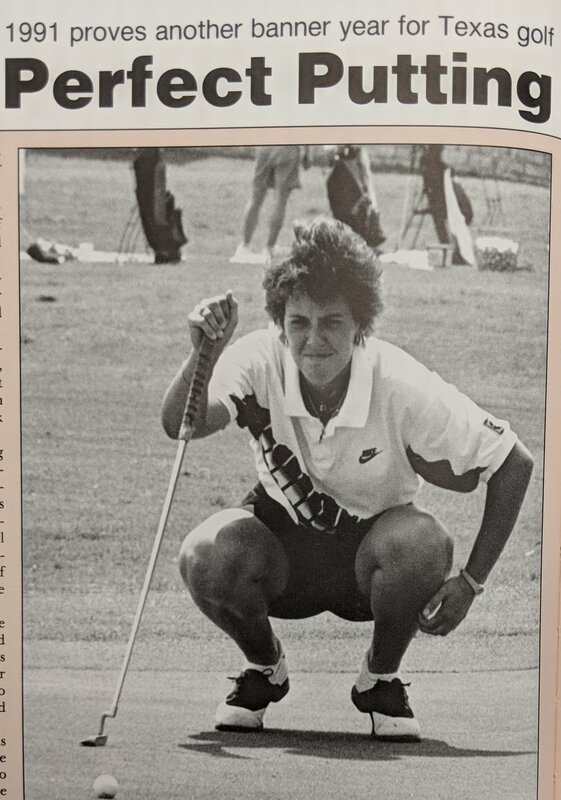 in Sugar Land where he had the pleasure of working with Piper Wagner, who after graduating from Dulles, played Golf for the Horns. From 1991-2000 he worked in the Rehab department of Athletic, Orthopedics, and knee center for Mark Provenzano, MD, and as October 2018 he has worked with s The Orthopedic Sports Clinic, with Mark Provenzano, MD, Carl Palumbo, MD, Juan Bustos, MD and Neil Badlani, MD. Juan knows photo opportunities. Check it out from 0:00 to the 1:11 on the attached link. In 2009 when Coach Royal was still alive he said to Juan Conde "we are the only two left that were on all three national championship teams" (1963, 1969, and 1970). In 2018 Juan is the only one remaining . In the early 60's , Juan was assigned by Coach Royal to issue equipment to the incoming freshmen and to take care of their everyday needs while Mr. Jim took care of the the sophomores, juniors and seniors. Juan followed the freshmen through the four years they were at Texas. He loved his job and made lifetime friends with all the football players. 2015 Texas Football Letterman golf tournament at Circle C. (Left to right) Juan Conde, A.D, Jim Hess, Rodney Doutel, Jeff Crozier. Coach Royal was not only about football, he also liked to have fun. He loved country music. Pictured from left to right - Darrell McCall; Hector Guerra; Louie Murrillo; Darrell Royal; Edith Royal; Juan Conde & Jerry Jeff Walker. We all had a fun night! 2015 Texas Football Letterman golf tournament at Circle C. (Left to right) Juan Conde, A.D, Jim Hess, Johnny Lam Jones, Rodney Doutel, Jeff Crozier. The Dark side Of Juan Conde- Allegations that he stole the 1969 Big Shoot-out game. He defends himself but…..
Juan says, unfortunately I do not have the 1969 Texas/Arkansas Shootout game 🏈 ball. As you recall, the weather at Arkansas on that particular day was miserable, cold, rainy and some sleet. So I had to replace many wet footballs 🏈 with dry footballs. I placed the wet footballs in a duffle bag. So there were many game 🏈 used in the game. After the game, I took them to the locker room and placed them with the rest of the equipment. The thought never entered my mind about keeping a game ball even though there were several. I was too excited about us winning the game. When we returned to Austin, Mr. Blaylock and I put all game equipment in the equipment room, including the wet game 🏈. That's the last I saw them. Now I wish I had kept one. Also, Bill Little, the Texas SID, for the longest time, though I had kept the plaque President Nixon presented to Coach Royal. I told him I didn't have it. I told Bill I heard President Nixon, while holding the plaque in his hands, tell Coach Royal since the plaque had not been engraved yet he was taking it back to Washington to have it engraved. That's the last time I saw it. And to think, of the twenty plus years I was the assistant equipment manager, I could have amassed many, many collectible items pertaining to Texas Longhorn 🏈 football, but unfortunately, I didn't. JUANS ACCOMPLISHMENTS ARE A REMINDER TO ALL LONGHORNS THAT IN SPORTS AND FAR BEYOND, HIS CONTRIBUTIONS TO LONGHORN HERITAGE SHAPE THE PRESENT AND EMPOWER THE FUTURE.